More than half of town halls admit using anti-terror laws to spy on families suspected of putting their rubbish out on the wrong day. Their tactics include putting secret cameras in tin cans, on lamp posts and even in the homes of 'friendly' residents. A householder who had his wheelie bin knocked over while he was out at work was prosecuted in a case that cost taxpayers thousands of pounds. Care worker Gary Rostron, 34, got home to find his bin bags spilling out in an alleyway, and was then fined �60 by council snoopers for dumping rubbish. When he protested his innocence and refused to pay, council chiefs took him to court for breaching environmental laws. But magistrates found him not guilty following a trial costing up to �3,000. 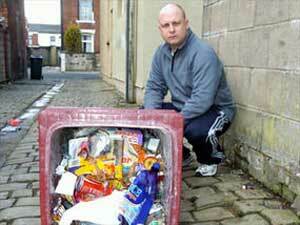 Last night Mr Rostron attacked the council for squandering taxpayers� cash. �This is penalising people who go out to work and who cannot put their bins out minutes before the binmen come, or bring them back in the moment they are emptied,� he said. This page contains a single entry by DaveH published on November 11, 2008 8:35 PM. Yet more people unclear - California and nutritional standards was the previous entry in this blog. Pushing back against the tide is the next entry in this blog.